Harold Clark Simmons was born in 1931 to two rural East Texas school teachers. When he was sixteen years old, his family, including two brothers, moved to a small town near Austin. He soon enrolled at the University of Texas where he was a member of the Southwest Conference Championship Basketball team of 1951. He earned his bachelor’s and master’s degrees in economics and was awarded a Phi Beta Kappa key. Harold’s first job was as an investigator for the U.S. Civil Service Commission, then as an Assistant Bank Examiner at the Federal Deposit Insurance Corporation. After five years, he decided he would rather work for himself and at age 29, Harold became an entrepreneur. He purchased a small drugstore near SMU in Dallas, known as Simmons University Pharmacy. In 1966, he made his first major acquisition, buying Williams Drug Co. Thirty more drug stores were purchased the next year followed by an $18 million buyout of Ward’s drugstores in 1969. In 1973, Harold sold his stores for $50 million in Eckerd stock. Harold then launched a career as an investor by buying major positions in publicly traded companies. After sometimes gaining control, he managed the companies to maximize the value of the investment for shareholders. Known for being a brilliant and creative financier, he ultimately consolidated his sizable holdings into Contran Corporation, which currently includes four corporations listed on the New York Stock Exchange. For many years, Harold enjoyed piloting his private aircraft, playing golf and sharing tales of Texas history. 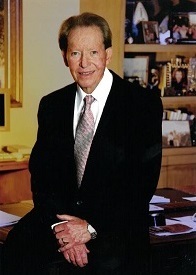 His other passion was philanthropy, and in 1988 he established the Harold Simmons Foundation, for which he served as chairman, until his death in 2013. Lisa Simmons and Serena Simmons Connelly manage the Foundation that supports nonprofit programs in the Dallas area. The Foundation focuses on education, health care, social welfare, civic improvement, and the arts and strives to continue the legacy of ‘giving back’ that was a guiding principle of Harold’s life.